Voice problems can be successfully treated when diagnosed early by Fort Worth ENT otolaryngologists (ENT – ear, nose, throat doctors). 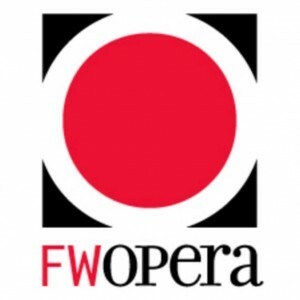 Fort Worth ENT is the official group of ENT doctors for the Fort Worth Opera and is one of the leading groups of physicians in advanced surgical ear, nose, throat and sinus care that treat vocal cord disorders. We provide evaluations and treatment for a large number of conditions afflicting the head and neck areas. The service we provide to our patients is of high quality and very comprehensive. 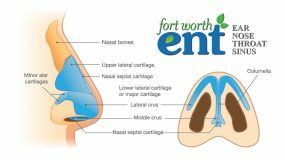 Our goal at Fort Worth ENT is to provide high quality and state-of-the-art treatment for conditions affecting the ear, nose, throat and sinuses. Our staff is committed to delivering outstanding patient care and making use of the latest medical advances to serve our patient’s needs. Voice is the sound made by air passing from your lungs through your voice box (larynx). The voice can be affected by a number of elements, including events, physical ailments and some diseases. In most cases, issues that are the cause of voice problems are not serious or life threatening and can be treated easily. A number of factors can be responsible for hoarseness or dysphonia, and it must be noted that dysphonia is more of a description than a condition. Any voice change that persists for two weeks or more should definitely be assessed by a physician to look for any potentially serious underlying issues. A doctor should also be consulted if symptoms include any voice changes without a linked illness, voice changes in connection with difficulty breathing or swallowing, and any voice changes that continue to worsen. Changes in pitch range, volume or quality are all signs of a voice disorder. Patients who use their voices for professional purposes, including as performers, may be more aware of issues related to their voices, even if the changes are subtle. 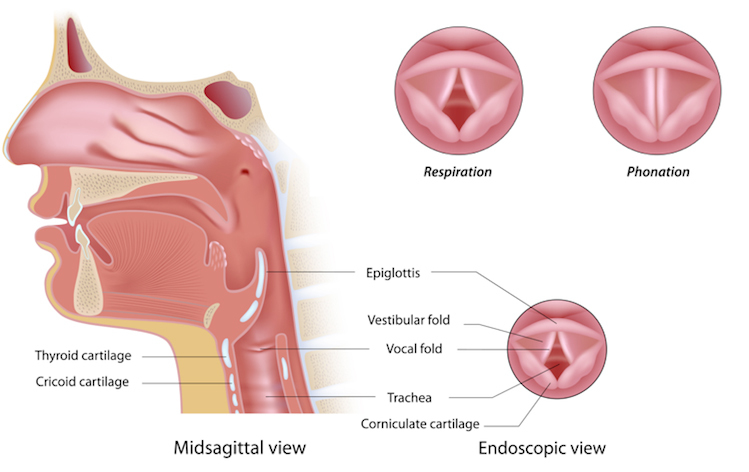 Laryngopharyngeal Reflux Disease (LPR): LPR occurs when stomach acid travels up into your throat, which is similar to GERD when stomach contents back up (reflux) into the esophagus. However, LPR symptoms are often absent (silent reflux) which can make it difficult to diagnose. One leading cause of voice issues is the presence of one or more lesions on the vocal fold. The vocal folds (otherwise known as vocal cords) are located on the top of the windpipe. When we breathe in, the folds move symmetrically. The lesions on the vocal folds are commonly benign (non-cancerous). A lesion is a structural defect, meaning an abnormality in an area of tissue. 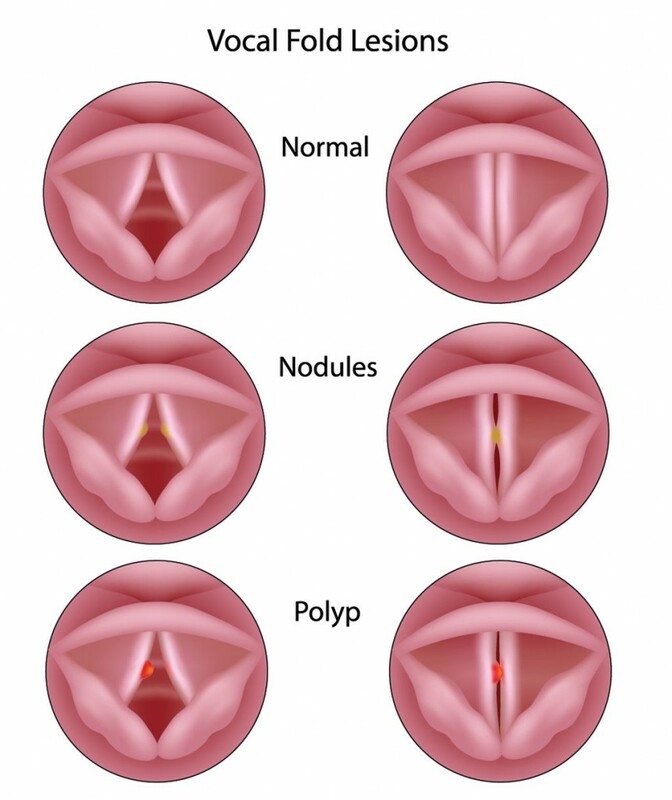 This abnormality will often affect the normal functioning of the vocal folds, resulting in some kind of voice disorder. When the voice produces sounds, the two vocal folds vibrate (they open and close against each other). The middle portions at the edge of the vocal folds collide with each other with the most amount of force, making this area the most susceptible to irritation. The edge of the vocal folds is therefore often where the granulomatous lesions are formed. It is not out of the ordinary for lesions to form on both vocal folds simultaneously, causing the lesions to be in perfect symmetry to each other. In other cases, a lesion may first form on one fold, and over time, due to irritation will form on the opposite fold, but in reaction to the first. In cases such as the latter, the lesions may form a ‘cup and saucer’ appearance where one lesion protrudes into the other. Discrete benign mucosal lesions are not painful, though they do cause damage and result in a more challenging process of voice production. The most obvious symptoms are that of a sore throat and perhaps a sore neck. The most common cause of these types of lesions is from repeated and prolonged irritation. This can come from a number of factors, including vocal abuse, gastric reflux or Laryngopharyngeal Reflux Disease (LPR), repeated upper respiratory infections and sometimes even certain medications. Additionally, vocal fold mucosal lesions are not painful, and when they occur, they are rarely felt by the patient. However, when they form on the surface of the vocal folds, mucous can often get stuck and accumulate. The buildup of mucous can make a person feel like there is something stuck in the throat and the natural reaction is most often to cough or ‘clear the throat’. If the vocal folds are afflicted by lesions however, regular coughing and throat-clearing may exacerbate the issue and worsen the lesions and symptoms caused by them. To ensure safe use of the voice, it is important to find replacement behaviors in place of coughing. 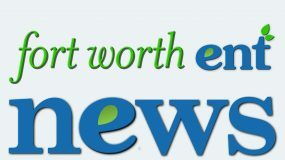 What makes Fort Worth ENT stand out from the crowd? What is different about Fort Worth ENT’s approach? At Fort Worth ENT, we take a multidisciplinary approach to vocal health. Our team is comprised of a variety of professionals including an ENT physician, voice coach, singing teacher and a speech pathologist. Prior to this composition of our team, each of these professionals worked independently and focused on their own areas of expertise. With the creation of the Fort Worth ENT team, we have created a highly comprehensive level of care by a team who is now able to communicate clearly and serve patients with an approach that looks much more at the bigger picture than simply its own role. At Fort Worth ENT we are committed to evaluating all elements of the voice in order to clearly diagnose any issues and provide the best treatment for your condition. 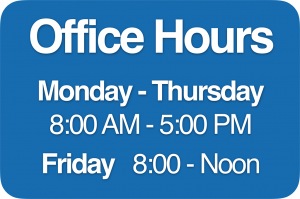 If you have any voice problems, please call our Fort Worth ENT office at 817-332-8848 to set up an appointment or submit an online appointment request.